Have you ever seen a repair shop that had a terrible online rating, and suddenly had a great one? 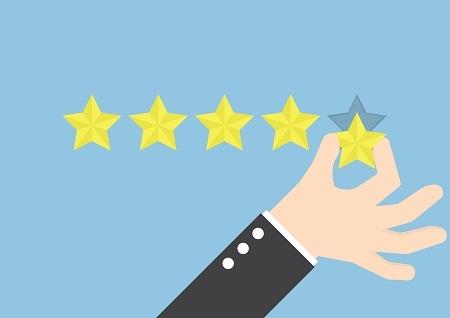 It’s hard to turn a terrible rating around in a few days – you have to have five reviews before Google will show your star rating, so if a repair shop has a two star rating, it’s going to take much more than a single positive review to push it up above a four. Often, these companies have a “sudden burst” of positive ratings. The grammar is questionable in the reviews. The people posting the reviews are not nearby, and they all say the same thing. If you’re competing with one of these businesses, this is extremely frustrating. They’re cheating their way to the top by hiring people to lie about their business. Meanwhile, you’re providing honest, quality service and you’re sitting below them with a 4-star rating. It might seem like these shops are beating the system – but it probably won’t last forever. Besides being unethical, it’s also a bad idea. First of all, it’s illegal. Just last month, someone was sentenced to 9 months in jail in Italy for writing fake TripAdvisor reviews – for fraud. It’s also dangerous for the purchaser. Companies with reviews from the fraudster were demoted on TripAdvisor, and many of the companies who purchased reviews were given the Red Badge. This badge is a warning to TripAdvisor users that the business had tried to manipulate their reviews – a kiss of death, because it warns TripAdvisor users that they can’t trust anything they read online about the company. Finally, it can be expensive. Both the government and online review directories can and have sued for posting fake reviews. Of course, if bad reviews have taken a toll on your business, there are other legitimate ways to improve your reputation. The easiest way is to ask for reviews from your best customers! Our integrated reviews service does just that – it asks customers how they felt about your service, and requests that the happiest customers leave legitimate reviews on online directories like Google, Yelp and Facebook. When customers indicate they are unhappy, you’ll receive a notification to contact them, so the issue can be corrected before they post negative information about your business online. This service will make your reviews more positive over time, while also giving you a chance to address any negative perceptions about your company that exist among former customers. To learn more about online reviews and legitimate ways to improve them, call us at 866-665-1605 or email us at Team_RSW@RepairShopWebsites.com.